The Illamasqua Broken Gel in Silver is part of the ‘Aftermath’ collection. The smooth, gel-based formula glides across the lid, infused with iridescent silver-fleck particles to create a glistening metallic layer that’s perfect worn alone or layered over eye shadow for an intensified effect. Dab at the inner corners of your eyes to instantly brighten, or pat lightly along cheekbones for a majestic radiance. 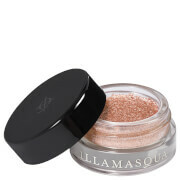 Apply all over the lid as a base, use as an eyeliner or dot at the inner corner of the eye. Can also be used as a highlighter. Aqua (Water), Glycerin, Triethanolamine, Phenoxyethanol, Acrylates/C10-30 Alkyl Acrylate Crosspolymer, Methylparaben, Glyceryl Acrylate/Acrylic Acid Copolymer, Allantoin, Ethylhexylglycerin, Propylene Glycol, Propylparaben, Synthetic Fluorphlogopite, Ci 77891 (Titanium Dioxide), Ci 77491 (Iron Oxides).